It is not hard to spot the flaw in the idea of intercessory prayer. God is going through his day, making plans, running the universe. Suddenly, he receives a message. Someone is praying, asking for his help. He hears the prayer, decides the petitioner has a good case, and makes the requested change. Or maybe he just ignores it. So what is the flaw in this scenario? Well, if God knows everything, then a prayer tells him nothing that he doesn’t know already. Would he really change the course of events based on a request, as if he did not already understand the situation? Swedenborg says no. That is not the way that it works. The omniscient, omnipotent, omnipresent God never changes. He never changes his mind. He never reverses direction. Since no one can influence God, such prayer is pointless. In Swedenborg’s system, however, prayer is not pointless. It just isn’t about influencing God. The point of prayer here is not to influence God. The point is “hope, comfort, or an inward stirring of joy.” The way that this works is that “our inner depths open up to God” (Secrets of Heaven §2535). In this setting, God is always the same; it is we who change. Prayer plays a role in this. But there is more to it. 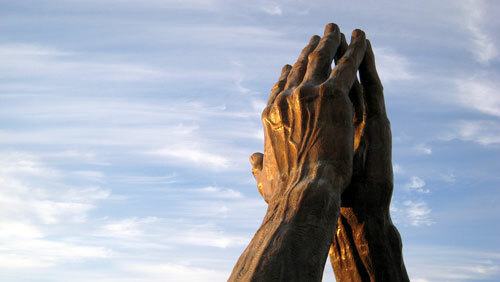 True prayer entails a person’s whole life. And the essence of prayer is that God’s will be done. The message is that prayer is not just a ritual, an aspect of our devotional life, but is key to a person’s whole life. This may seem to take the magic out of prayer. But in Swedenborg’s system, there is something else that puts the magic right back in. People, of course, do not just pray for themselves. It is human nature to care for other people. This is surely what religion is all about. One thing that people may not know, however, is that the emotions involved in that caring and the prayers that naturally spring from them do not remain contained within the person who feels them. They are communicated without our even being aware of it. According to Swedenborg, angels are able to “communicate to another the goodness, blessedness and bliss that they themselves have received” (Secrets of Heaven §6478). Goodness in heaven is thus “communicated from one to many by means of a real transferring that is remarkable” (Secrets of Heaven §1392). This communication happens by means of the spheres that surround everyone, both in heaven and on earth (Secrets of Heaven §§8794:5, 10130:3)—for a person’s sphere “deeply affects other people” (True Christianity §433). The communication of love has tremendous power, whether it is expressed in tangible or intangible ways, for love carries all good fortune, success, and healing within it. When people—whether many or few—love and pray for someone, that love is communicated through heaven to that person. While it may or may not have any tangible physical effect, the spiritual and emotional effects can be like the moving of a mountain. The collective love and prayers of large numbers of people exert a tremendous societal force, something that people are only beginning to understand. So, according to Swedenborg, prayer does not influence God. But prayer is not pointless: it has the power to literally change the world. Jeremy Simons is former Senior Pastor at the Bryn Athyn Cathedral and today in retirement serves as the Cathedral Chaplain. See also Spiritual Experiences §§1300, 5976; Secrets of Heaven §§452, 952. This is exactly what I was interested in! Because someone asked to start a prayer chain and I was thinking today about my daughter and how she has been illl for 3 years and wondering…if I got 2000 people to pray for her would it help her? Would it heal her? Or would it just make us all feel the love of others or would it create a miracle. Thank you for your article and sending the link. I really appreciate it.